﻿Modern flint knappers chip away at a Stone Age art. ﻿﻿Have you ever picked up an ancient arrowhead, marveled at its workmanship, imagined the hands that shaped it centuries ago and wondered, “How did they make that?”Thousands of flint knappers across the United States — and hundreds in Texas — don’t just imagine, they make their own. They’ve mastered the lithic craft of flint knapping, the process of creating stone tools through chipping and pressure-flaking techniques. From replicas of rare Clovis points to antler-handled obsidian knives, exquisite knapped pieces abound online and at rock shows, powwows and gatherings called “knap-ins.” Watch a knapping demonstration and you’ll be amazed at how quickly a knapper can chip a chunk of chert or piece of flint into a finely flaked point. A skilled knapper makes the craft look as effortless as whittling a stick. Whack, whack, whack and presto: an instant artifact. But it’s much harder than it looks. The word “knap,” of Germanic or Gaelic origin, means to break with a quick blow or to shape by breaking off pieces. In 18th and 19th century England, a flint knapper was a skilled craftsman who chipped gunflints for flintlock firearms. Flint — the hard, brittle, dark-gray mineral remnants of ancient sea creatures found in sedimentary chalk deposits — remains the preferred material for today’s knapping enthusiasts. Flint and its close cousin chert, as well as novaculite, agate and jasper, are fine-grained, cryptocrystalline forms of silica or silicon dioxide, the chemical ingredient of quartz and glass. Flint knappers also work with noncrystalline silica such as obsidian (volcanic glass) and manufactured materials including plate, bottle and fiber-optic glass. All silica materials fracture and flake conchoidally when chipped, meaning they fracture with smooth, curved surfaces that resemble the inside of a seashell. Think of a BB pellet striking a glass window, creating a cone-shaped fracture. Knappers visualize this cone pattern when striking a rock core with a billet or hammerstone, varying the angle and force of their blows to control the size and shape of each flake. The fractures form razor-sharp edges, making silica-based stone an ideal material for prehistoric tools. Like fire building, flint knapping seems etched into our DNA as a survival skill. The oldest known stone tools, discovered at hominid sites in East Africa, date back 2.6 million years. In the Americas, paleo-Indians created elegantly fluted spear points to hunt mammoths and other megafauna some 12,000 years ago. By the early historic period, projectile points grew simpler and cruder as Europeans introduced metal tools in the Americas. Flint knapping became a lost art as stone tools grew obsolete. In the late 19th century anthropologists began experimenting with knapping to gain insight into prehistoric lithic industries. Hobbyists also learned to knap — sometimes for illicit profit, creating fakes to sell to unknowing collectors. Today most commercial knappers sell their work as contemporary art, disdaining cheaters who misrepresent their modern creations as ancient artifacts. One of the seminal figures of the 20th century flint-knapping revival, Ishi — the last surviving Yana Indian — emerged from the wilds of Northern California in 1911 and spent the last few years of his life at the University of California at Berkeley. Anthropologists learned a lot about knapping from Ishi, including how to “pressure flake” a point’s edge with a long, nail-tipped “Ishi stick,” widely used by modern knappers. By the mid-1960s archaeologists began divulging flint-knapping techniques. Until then, scientists remained tight-lipped because they didn’t want the general public — and potential counterfeiters — to learn the secrets of knapping. In fact, many people used to believe that Native Americans made arrowheads by throwing cold water onto hot stones. The most influential academician in the American knapping scene was Don Crabtree, the father of modern flint knapping. A self-educated paleontologist and lithic technologist, Crabtree taught countless knappers and organized the first knap-ins in the late 1970s. Around that time, another prominent knapper, D.C. Waldorf, published The Art of Flint Knapping, which has informed a generation of knappers. Flint knapping exploded with the rise of “knap-ins” and information sharing over the Internet. Nowadays you can order knapping books, instructional DVDs, tools and rock supplies online and view hundreds of YouTube demonstrations. Contemporary knappers often re-create exemplary Native American projectile types such as fluted Clovis and Folsom points and deeply notched Andice and large Scottsbluff points. Most experienced knappers prefer the challenge of large works over “bird points,” a misnomer for small arrowheads typically used to hunt mammals rather than birds. The best way to learn flint knapping is to watch experts at work. Many accomplished knappers enjoy demonstrating their craft and teaching others at knap-ins, such as the Pedernales Knap-in held in April near Fred­er­icksburg and the Horseshoe Bend Knap-in held on Memorial Day weekend in Weatherford. How long does it take to learn to knap? Ken Jones is a retired pilot living near Lake Fork who makes and sells knapping tools. 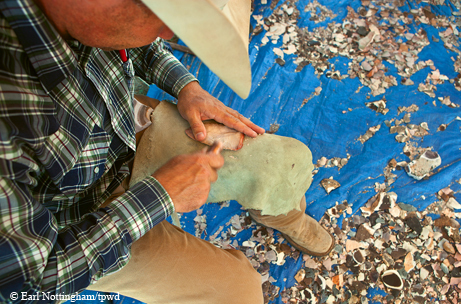 Mike Dixon, a retired chemist from Grand Prairie, picked up knapping on his own 12 years ago. At first he “made a real mess of it” until he attended knap-ins and learned from others. 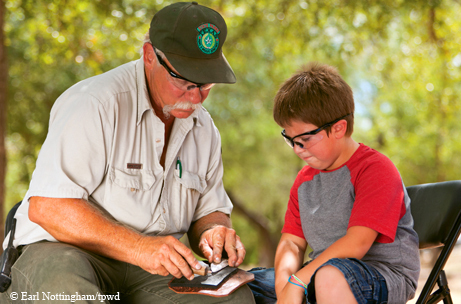 Gary Verstuyft, a park ranger at Enchanted Rock State Natural Area who teaches flint knapping to the public through Texas Parks and Wildlife Department programs, knows all about rock fever. J.C. Pollard passes down 40 years of knapping knowledge to children through Austin-area nature programs and to adult knappers who join weekly knap-ins at his ranch. Parker teaches knapping and offers an instructional DVD, Flint Knapping: 100 Pounds of Attitude. “The premise was to teach women and children technique over brute force,” she says. Although men predominate in today’s subculture of 21st century flint knappers, Parker has broken through the “stone ceiling,” inspiring many women to become lithic artists. That’s only fitting. Archaeological evidence suggests that women in prehistory made stone tools and projectile points, and some Native American women were buried with their knapping tools. If you try your hand at knapping, expect to bash a lot of pretty rock into flakes, cut your fingers, bruise your legs (and ego) and create some crude arrowheads. Chances are, you’ll catch rock fever and keep at it for the sheer paleo fun of it. So You Want to Be a Flint Knapper? • Indirect percussion: Using a hammer and punch to break away small bits of rock. • Pressure flaking: Applying pressure with a pointed tool to drive off small flakes for final work such as straightening edges. • Primitive or aboriginal (“abo”) knapping: Using traditional tools (antler and stone). • Modern knapping: Using copper tools for percussion and pressure flaking. • Lapidary knapping (“lap knapping”): Pressure-flaking forms cut into the approximate shape of points and blades. • Flake over grinding (“FOG”): Pressure-flaking forms contoured and polished with a power grinder. 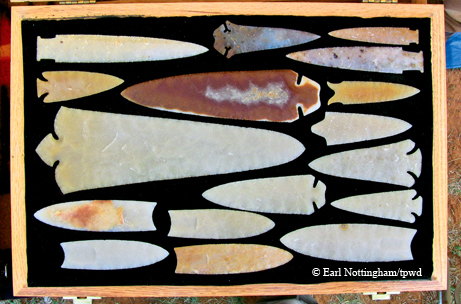 Flint knapping tools are easy to make and available online and at knap-ins. Abo knappers use stone, antler, bone and wood tools for percussive flaking and sharp antler tines for pressure flaking. Modern knappers use copper billets and “boppers” (lead-filled copper-capped billets) for percussion, as well as handheld pressure flaking tools and Ishi sticks tipped with copper nails. Knappers pad their knees with thick pieces of leather. They work over tarps to catch debitage for safe disposal; they also work outside or in well-ventilated areas to avoid inhaling silica dust (which can cause the lung disease silicosis). Some knappers wear leather gloves while handling obsidian and glass and safety glasses to protect their eyes from flying flakes. Knappers use abrading stones to clean up the edges of a biface in progress, creating a solid platform for percussive blows or pressure flaking. Scour road-cuts and publicly accessible riverbeds in Central Texas for chert and flint. (Remember, it’s illegal to collect rocks in state and national parks.) Good Texas rock includes gray Edwards Plateau chert from the San Antonio area; brown Pedernales chert nodules found around the Pedernales River; translucent “rootbeer” chert from Junction; blue-gray Georgetown flint found in chalk beds near Georgetown; and gorgeous Alibates flint (agatized dolomite) from the Canadian River area. Chert often must be heat-treated to improve its knapping qualities. Many knappers buy heat-treated rock and slabbed preforms online and at knap-ins.